and the walls, they are cautious. Well maybe we should introduce ourselves, that why he isn't so frightened. 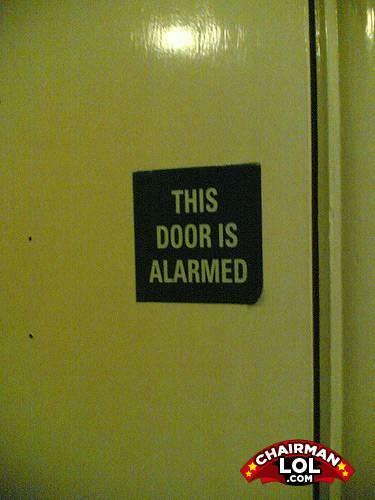 HAHAHAHA door is alarmed classic!!! How alarming . . . . . . .
Is this also one of the doors that is handeled? Oh dear! Did a window shut on the door? Yet again, perfect English, just a funny pun. -Do your feet hurt? Because I couldn't help but notice you look about 75 pounds overweight and I hear that is rough on your feet.